Land Rover Range Rover is an iconic luxury SUV available in the automobile market. This sophisticated vehicle is available in several trim levels with petrol and diesel engine option. At the same time, there is a long wheelbase version available that comes in four variants. 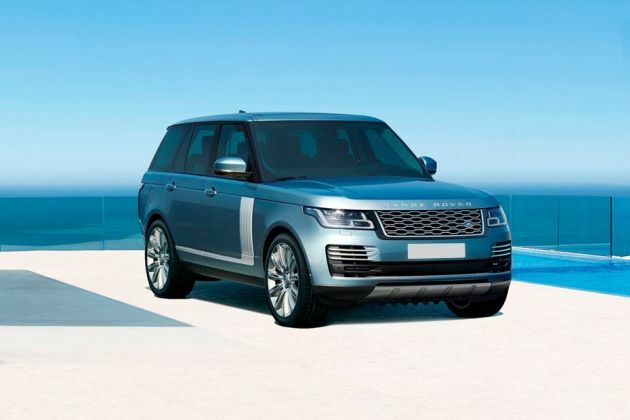 The Land Rover Range Rover LWB 5.0 V8 is the top end trim that is powered by a 5.0-litre supercharged petrol engine. It is capable of unleashing a maximum power of 503bhp and results in a peak torque output of 625Nm. This top end LWB version is equipped with several innovative aspects Terrain response 2, cruise control system and an active speed limiter. On the other hand, it also has safety aspects like volumetric and perimetric alarm with engine immobilization, which restricts any unauthorized access to the vehicle. As far as the comfort features are concerned, it is equipped with 18-way adjustable front seats that includes massage facility, heating and memory function as well. This SUV has immense cabin space, which provides seating space for at least five passengers. This vehicle is placed against the likes of Audi Q7, Mercedes Benz GL Class, G Class and Toyota Land Cruiser in the Indian car market. Its external appearance is quite magnificent thanks to its trademark exterior features. On the front facade, its headlight cluster is quite sleek and is powered by signature LED headlamps and DRLs. It surrounds a wide radiator grille that has three expressively crafted slats along with 'Land Rover' insignia. The front bumper is in a two-tone look as it is affixed with a black colored protective cladding. In addition to these, it also has a pair of air ducts and LED fog lamps as well. The overall appearance of the front is emphasized by the 'Range Rover' lettering engraved to the bonnet. This SUV has a splendid side profile with neat finish down to its lowest detail. The main highlight is its stylish roof lining with contrast full size panoramic roof. There is an option to customize this roof lining with a choice of two colors like Santorini Black and Indus Silver. Its wheel arches are fitted with a set of 20-inch five split spoke style alloy wheels, which are neatly done up in shadow chrome. Its door handles are in body color, while the wing mirrors and pillars are in glossy black finish. Its rear profile has a sophisticated look with a large windscreen, LED tail-lamps and an expressive tailgate . Its bumper is equipped with a black colored under-body cladding, which gives it a dual tone look. This Land Rover Range Rover LWB 5.0 V8 trim has an Ebony Black and Ivory color scheme, which is further decorated with Figured Macassar wood inserts. Its cockpit has a stylishly structured dashboard that comes fitted with an instrument panel, AC unit and a storage compartment. The central console has been equipped with an advanced infotainment system featuring a 20.32cm touchscreen display. It has a leather wrapped steering wheel with four spokes and is further mounted with multi-functional switches . Both the seats in cockpit can be adjusted in eighteen different way using memory setting. They are also incorporated with lumbar support, heating facility and massage function as well. Its rear cabin has bench seat that has a load through facility and power reclining function as well. The company is also offering executive class seating arrangement in the rear cabin with two individual seats and a cooler compartment. There are number of utility based features provided inside like front central console with cooler compartment, customer configurable interior mood lighting, auto dimming inside rear view mirror and heating function for steering wheel. This variant is powered by a 5.0-litre petrol engine that has a displacement capacity of 4999cc . It comprises of eight cylinders and thirty two valves that receives fuel through a direct injection system. It is further incorporated with a supercharger that allows the motor to produce a maximum power of 503bhp between 6000 to 6500rpm and yields a mammoth torque output of 625Nm between just 2500 to 5000rpm. It is paired with an advanced eight speed automatic transmission gearbox that powers all the four wheels in a 4WD layout. Braking and Handling: All four wheels have been fitted with a set of internally vented brake discs, which are further loaded with superior brake calipers. It is also incorporated with an anti lock braking system, emergency brake assist and cornering brake control system. In addition to these, it has dynamic stability control, electronic stability program and trailer stability control, which keeps the vehicle agile. On the other hand, it is bestowed with electronic air suspension system including adaptive dynamics, which reinforces the stability of vehicle. At the same time, it comes incorporated with an electronic power assisted steering system with speed related function, which reduces the efforts required by its driver. The Land Rover Range Rover LWB 5.0 V8 trim is the top end variant that is incorporated with several advanced features. It has a list of features including four-zone automatic climate control system, interior mirror with auto dimming effect , customer configurable interior mood lighting, carpet mats and a cooler compartment in front console. In addition to these, this SUV has front center armrest, winged headrests and keyless entry. Furthermore, it comes with rain sensing windscreen wipers, automatic headlamps with high beam assist and soft door close function. Apart from these, this SUV is also equipped with park distance control for front and rear with sensors and visual display, which makes it quite convenient for the driver. The car maker is also offering an 825W Meridian surround sound system and rear seat entertainment system with two 20.32CM displays. This top end variant is blessed with some sophisticated safety aspects, which provides protection to the vehicle and its passengers. The list includes emergency brake assist, dynamic roll and stability control and airbags for front passengers including side, thorax and pelvis airbags. Furthermore, it is integrated with electronic stability program, hill descent control and ABS with EBD as well. 1. Interiors are extremely spacious and luxurious. 2. Acceleration and performance of engine is remarkable. 1. Executive class rear seating can be offered as standard. 2. Maintenance and spares are very expensive.